I don’t use a slow cooker very often but once in a while I get an urge for my favourite Chicken and Orange Curry which really suits this method of cooking. I have no idea where the recipe comes from – it is on a browned, aged, single page torn out of a long-forgotten recipe book – spotted and marked (probably by the curry) – which I haven’t yet scanned into my online recipe collection. I tend to use skinned and boned chicken thighs for this recipe; breasts don’t seem to work as well and my husband has a ‘thing’ about bones so I don’t use drumsticks very often. I tend not to have marmalade so instead I use the grated zest of an orange and chop up the flesh and add it instead. But whatever you use, the wonderful curry/orange aroma pervading the kitchen for a few hours has us licking our lips and looking forward to a very tasty dinner. Heat the oil in a large fry pan, add the chicken and brown quickly on all sides. Transfer to the slow cooker. Add the onion, green pepper and garlic to the pan and cook, stirring occasionally until softened but not browned. Stir in the curry powder and cumin and mix well. Add the remaining ingredients, except the cornflour, and bring to the boil, stirring. Pour over the chicken. Put the lid on and cook on LOW for 3 to 6 hours. About 30 minutes before serving, switch to HIGH. Blend the cornflour with a little water or orange juice and stir into the slow cooker. Replace the lid and leave to thicken. Garnish with fresh orange slices and serve with rice, a bowl of plain yoghurt, banana slices and shredded coconut. 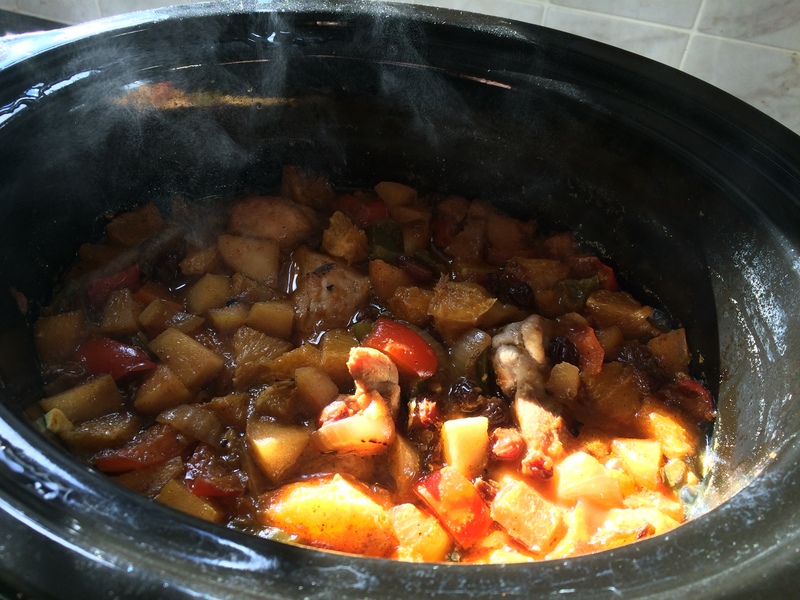 This entry was posted in Dinner and tagged Chicken, Curry, Dinner, Gluten Free, Healthy Eating, Orange, Peppers, Wheat-Free. Bookmark the permalink.